Monomaster – A great product for a cleaner environment! A great product for a cleaner environment! 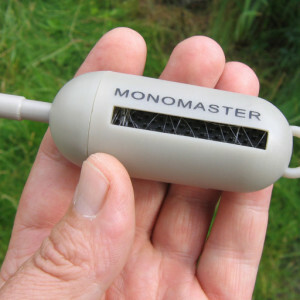 The Monomaster is a very handy gadget designed to store waste nylon monofilament and other fishing line. It stores pieces of used line out of harm’s way and thus keeps both the environment and your vest pockets and tackle boxes clean and tidy. No more nasty surprises in your washing machine, either! Waste nylon takes forever to break down and is a deadly trap for many small animals. That is why it is essential to keep waste nylon out of the environment and discard in a responsible manner. The Monomaster is the perfect solution and should be used by every nature-loving fisherman and -woman on the planet. Leading USA magazine ’Field and stream’ has awarded the Monomaster the ‘Best of the Best’ gold award in the category ‘fishing gadgets’. ‘Fish Alaska’ magazine awarded the Monomaster a silver medal in the category ‘other good stuff’. We only place cookies that are strictly essential for the correct working of the website. We do not place any other cookies like tracking / statistics / advert / third party cookies. We value your privacy: we do not collect any data from you. your personal settings at YouTube / Google. We do not get any data from that.